0 Comment June 25, 2018 Like? Camera controllers can be expensive, and in many cases they require manual control and do not have the ability to synchronize with other hardware or software. Because of this many producers often require an entire team to run live streams, performances, broadcasts and such. PTZOptics is developing new ways to control PTZ cameras with MIDI to solve these problems, and give creators the ability to completely automate their cameras in sync with their favorite hardware and software. Each note is assigned a unique camera, each with its own set of presets. With 12 cameras this gives you the ability to program 120 different presets in total, which is ideal for even the biggest productions. Additional software may be required to send the PTZOptics MIDI PTZ App data from your MIDI system. If you want to send MIDI over your network you can create a session to use with your MIDI Network Setup. This will be available as an input/output in your DAW Software. We are suggesting two applications for sending and receiving MIDI. Loopbe can be thought about as a virtual MIDI cable that connects multiple applications. It can easily be used for sending MIDI commands to our app. The rtpMIDI-driver is a virtual MIDI-driver which allows DAW-applications to communicate via network with other computers. rtpMIDI has a great tutorial for setup here. TouchOSC is a wireless TouchScreen system that can be customized to control just about any system that accepts MIDI or OSC Messages. This system is supported by many live streaming systems such as the NewTek TriCaster, Wirecast and vMix. Using a 3rd party app called atemOSC, Blackmagic ATEM Video Switchers are also supported. 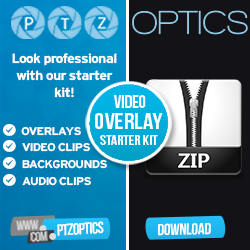 PTZOptics cameras are also supported using the free PTZOptics MIDI Control App.